Abstract: Ongoing medical acupuncture is being performed as an adjunctive therapy to treat pain associated with canine osteoarthritis secondary to hip dysplasia. Four treatments have been completed thus far, with positive feedback from the owner about improved comfort, mobility, and energy. The owner would like to continue treatments long term as she has witnessed an improvement in the pet’s overall quality of life and pain management since starting acupuncture treatment. History and Presentation: Tonto is an 8-year-old male neutered Brittany that presented for pain and weakness in the hind end and difficulty going up and down stairs. He has a history of bilateral hip dysplasia (diagnosed in 2011 per referral report), more severe on the left side. Tonto also has severe bilateral osteoarthritis of the coxofemoral joints, diagnosed radiographically. Tonto has been on long-term Dasuquin (glucosamine and chondroitin) and a veterinary joint health diet. In December, 2016 Tonto moved to a new home with stairs and hills, whereas his previous environment did not have stairs. In this new environment, he was reluctant to go up and down the stairs, so in May, 2017 the owner elected to try medical acupuncture. Tonto also started treatment with carprofen and Adequan (polysulfated glycosaminoglycan) at this time. His owner is active and Tonto spends a significant amount of time enjoying nature, hiking, camping, and swimming. The owner would like Tonto to be able to participate in these activities while appropriately managing the pain of osteoarthritis. Physical Examination and Clinical Assessments: On initial presentation, Tonto had bilateral stifle crepitus and was resistant to extension of both hips. Mild bilateral temporal and generalized hind limb muscle atrophy were observed. Tonto weighed 20 kg and had a body condition score of 5/9 (ideal). Taut bands were palpated along the caudal epaxial muscles, forelimbs, shoulders, lateral thighs, and lateral cervical region. All other physical exam findings were within normal limits, including neurological examination. Radiographic findings included severe bilateral osteophyte formation of the coxofemoral joints, thickened femoral necks, and moderate spondylosis of the lumbar spine. Medical Decision Making: The chosen acupuncture approach aimed to target the hips both peripherally and centrally by neuromodulation of the sciatic nerve, cranial gluteal nerve, and thoracolumbar spinal nerves. Autonomic points were selected to help direct the body toward homeostatic function and promote relaxation. In addition, taut bands were identified during myofascial palpation and were targeted with a combination of needling and massage. Acupuncture was also used for trigger point deactivation in the neck and shoulders that likely resulted from compensation for gait abnormalities. The primary goals of treatment were to promote analgesia by reducing firing of nociceptive pathways, improve circulation and oxygenation, and decrease inflammation and pain at trigger points. Differential Diagnoses: The differential diagnoses of hip dysplasia and osteoarthritis were based on physical examination, history, and radiographic evaluation. Definitive (or Putative) Diagnosis (or Diagnoses): The definitive diagnoses of hip dysplasia and osteoarthritis were based on physical examination, signalment, radiographic analysis, and supported by response to targeted treatment. Acupuncture Treatments: Tonto started on weekly acupuncture treatments for 3 weeks and then continued on twice monthly treatments. Treatment points included GB30 and BL54 for neuromodulation of the sciatic nerve and GB29 to stimulate the cranial gluteal nerve. Bai hui was selected to relieve lumbosacral pain by neuromodulation of mid- to caudal lumbar spinal nerves. BL27 was used to stimulate the S1 spinal nerve and target the sacroiliac region. SP10 and ST34 were used for stifle analgesia via neuromodulation of the femoral nerve. SI11 and SI12 were targeted for deactivation of trigger points in the triceps and targeted the suprascapular nerve. BL13, BL14, and BL15 were selected due to taut bands and local pain in the cranial thoracic region, and mid-cervical spinal points were used to treat taut bands in the neck. Autonomic points included GV20 and GV14, which were chosen due to their central location and ability to target neck and thoracic limb pain, as well as ST36 for its local effect on the pelvic limb and parasympathomimetic effect. 0.18 x 30 mm Seirin, 0.20 x 30 mm Seirin, and 0.20 x 25 mm Carbo needles were used for dry needling, with adjunctive use of massage for taut bands. 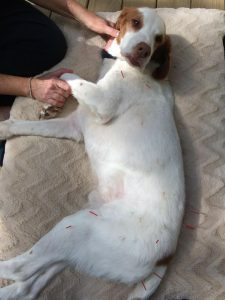 Acupuncture points were varied and customized during each session depending on current myofascial palpation, previous response to treatment, and the pet’s immediate reaction to stimulation and treatment. Treatments were bilateral when possible. Outcomes, Discussions, and References: The owner reported an improvement in the speed and confidence that Tonto has when going up and down stairs, walking on an incline, and an overall increase in energy. Tonto appeared nervous during his first acupuncture session, but since then has been an eager participant. Since starting acupuncture, the owner decided to stop Adequan injections but has continued giving an NSAID. Tonto appears less painful with the NSAID alone, but analgesia, mobility, and activity level are observably improved following acupuncture treatments. No adverse events were observed at any point during treatment. This case highlights the potential effect of neuromodulation on mobility and analgesia in patients with chronic osteoarthritis. The outcome observed in Tonto is consistent with current published scientific literature.1,2 In Tonto’s case, the benefits he received from medical acupuncture exceeded the observed benefits of NSAID treatment and joint supplements alone. A combination of medications and medical acupuncture appears to have a synergistic effect on the reduction of symptoms associated with hip dysplasia and subsequent osteoarthritis. 1. Magden E, Haller R, Thiele E, Buchl S, Lambeth S, and Schapiro S. Acupuncture as an Adjunct Therapy for Osteoarthritis in Chimpanzees (Pan troglodytes). J Am Assoc Lab Anim Sci. 2013 Jul; 52(4): 475–480. 2. Manyanga T, Froese M, Zarychanski R, Abou-Setta A, Friesen C, Tennenhouse M, Shay BL. Pain management with acupuncture in osteoarthritis: a systematic review and meta-analysis. BMC Complement Altern Med. 2014 Aug 23;14:312.